Be the first to share your favorite memory, photo or story of Dani. This memorial page is dedicated for family, friends and future generations to celebrate the life of their loved one. 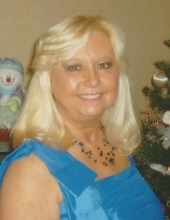 Dani Raye Wright Gaines, age 62, mother to Jeremy Gaines of Georgetown, passed away Thursday, April 4, 2019 in Georgetown, Kentucky. She was the daughter of Richard Wright and Clarence and LaVerne Power Ryan. She was a member of Northside Christian Church and worked at Sports Connection the last 13 years. She enjoyed spending time with her nieces and nephews. She was loved by many. In addition to her son she is survived by her brothers, Glenn (Theresa) Wright, Michael (Nancy) Ryan, Keith (Tammy) Ryan and sister Tracey ( Jerry) Kendrick, all from Georgetown, Kentucky. She is also survived by a special friend Sherrie Harper and her granddaughter, Montana. Visitation for Dani will be Saturday, April 6, 2019 from 4 to 7 at Tucker, Yocum & Wilson Funeral Home. To send flowers or a remembrance gift to the family of Dani Raye Wright Gaines, please visit our Tribute Store. "Email Address" would like to share the life celebration of Dani Raye Wright Gaines. Click on the "link" to go to share a favorite memory or leave a condolence message for the family.